For the adventure of a lifetime, come commune with the thousand-year-old sentinels of California’s Northern Coast - the Giant Redwoods. Their quiet majesty will make a tree-hugger of you! These trees are the world’s tallest and among its oldest. The ancient redwood groves reside along the Northern Coast, starting right across the Bay from San Francisco in the fabled Muir Woods. Once you have picked up your BlissRV and provisioned at Mollie Stones market here in Sausalito, drive directly to the Muir Woods National Monument. Step into the woods for a forest bath to mark your arrival at a special place - and the beginning of very special time, your adventure. 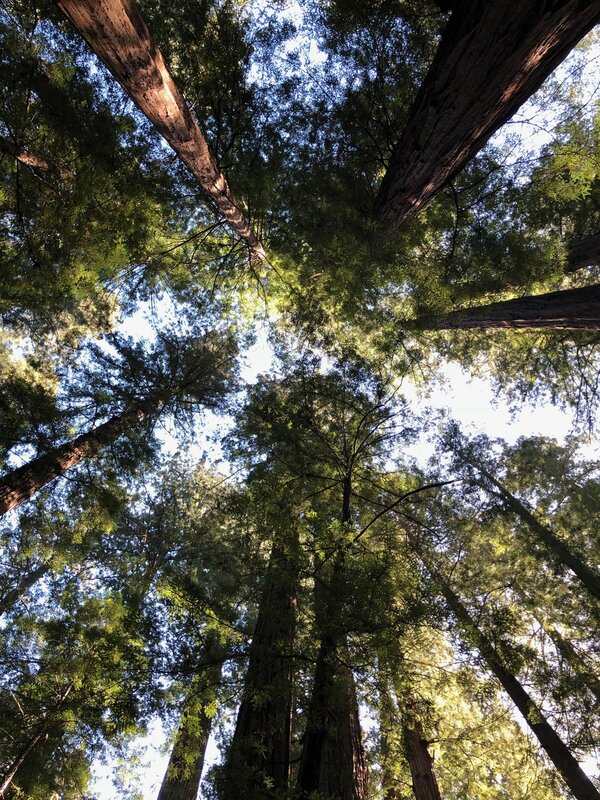 For RV camping amongst the Redwoods, you’ll head further north to Hendy Woods State Park and Humboldt Redwoods SP. 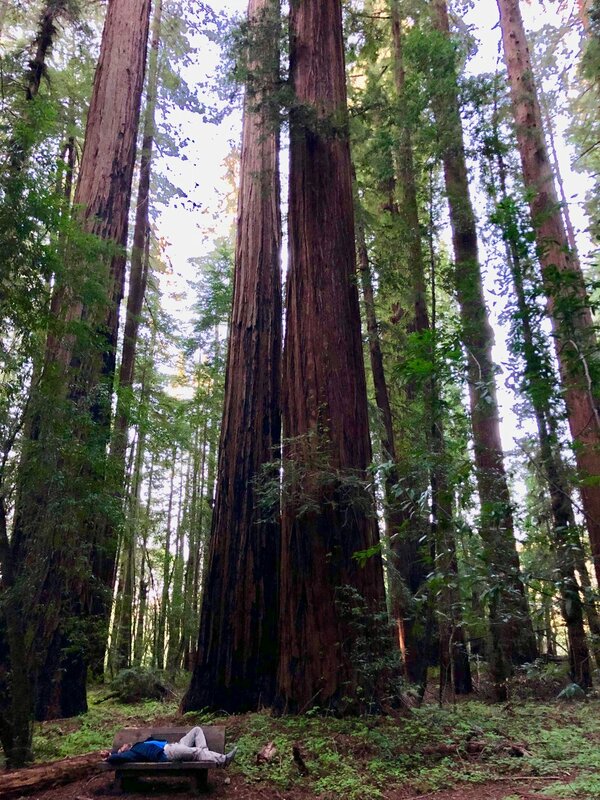 Big Hendy Grove is one of the best, and lesser-known, ways to experience the Giant Redwoods and it is just 2 1/2 hours north of Sausalito. Besides offering great RV camping sites and giant redwoods, Hendy Woods SP’s location in the wine country means that you are invited to partake of Northern California food culture! On your way into camp, stop at Lemon’s Philo Market for local bubbly, cheese and roasted coffee. Avenue of the Giants - this unforgettable drive through the giant redwoods lives up to it name. The largest old growth redwood forest in the world is within Humboldt Redwoods State Park, and the campgrounds here, such as Burlington, are scenic and serene destinations in their own right. Make a stop at Bolling Grove for an introduction to the Giants. We like this grove for its disarming proximity to the Avenue. Visit Founder’s Grove to seek out “Founder’s Tree” and “Tall Tree” and let Nature instruct you in mindfulness and humility. As a compliment to the natural majesty of the ancient groves, enjoy some good old-fashioned, touristy, roadside attractions. We love One-Log House - where you can stop in for an espresso, gift shopping and to tour a home fashioned from the carved-out trunk of a 2,100 year-old redwood tree. On top of that, you can select some fine, locally grown marijuana in the stylish, redwood-paneled dispensary. Don’t forget to get a pic in front of the Grandfather Tree and keep a look-out for Bigfoot.